Even though this is yet another hoppy saison, this beer represents a huge deviation from my standard protocol. First, the grain bill is wildly different than previous batches. I am gong to start moving into more complicated / interesting grain bills than I have before. I used to use a variety of grains in the past but things kept getting simpler, now I want to reverse that trend and make some interesting malt bill beers. I’ll see how that turns out I suppose. Second, I’m going to start doing a better job following the pH of beers and doing more with water chemstry. I’m still waiting on the chemical analysis of my water but soon all of my beers will be optimized for pH, magnesium, calcium, sodium, carbonate and so on. 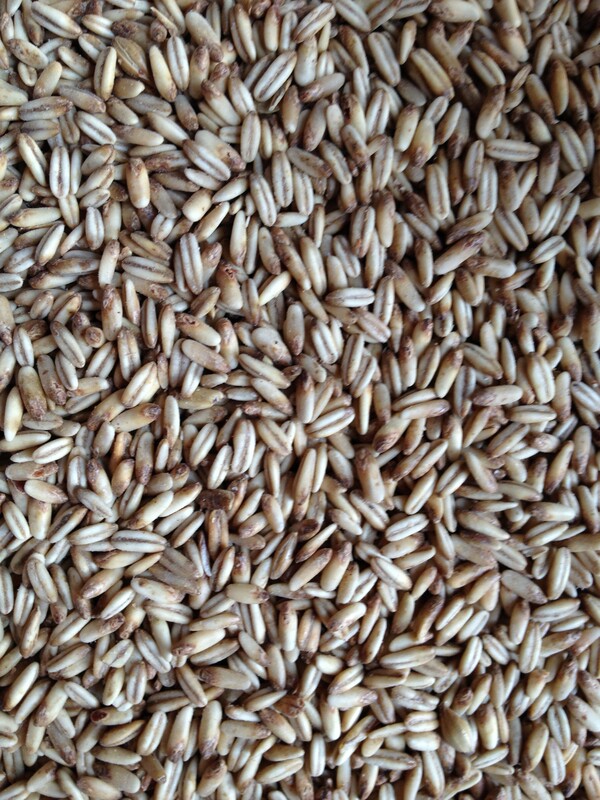 A new grain that many of you might not have considered using before is Naked Golden Oats. I’ve never used this either but after getting a small sample I decided I had to try to use it in a beer. The grain tastes like oatmeal cookies (always eat your grain) and looks unique from any other grain I’ve seen. In a beer, this grain is said to give a sweet berry-nut flavor. I’ve had one homebrew that used it at about 10-15% of the grain bill and the beer had this creamy, cookiesness to the beer and great head retention, credited to the use of this hop. “Shaving cream head” is often how the heads of beers that utilize this hop is described (that’s an awkward sentence). Really excited to use this. I’ve also used some acidulated malt in this beer, at about 10% of the overall bill. Acidulated malt has some lactic acid and can be used to add a slight “twang” of acidity to a variety of styles. 2-3% for dry stouts will give the finish a nice little sourness, I went up to 10% which might give me as much as a 0.5 – 1 point pH drop. I will measure the pH of the final beer and report it in one of the sections below. I’ve used acidulated malt in the past, in this blog I used it in the Brettanomyces clausenii ale at 10% of the grain bill as well. I think you could get away with using more than 10% but if you want a sour beer without using sour organisms, you would probably get more consistent results by just adding lactic acid to the wort directly. But that is something I have not tried. 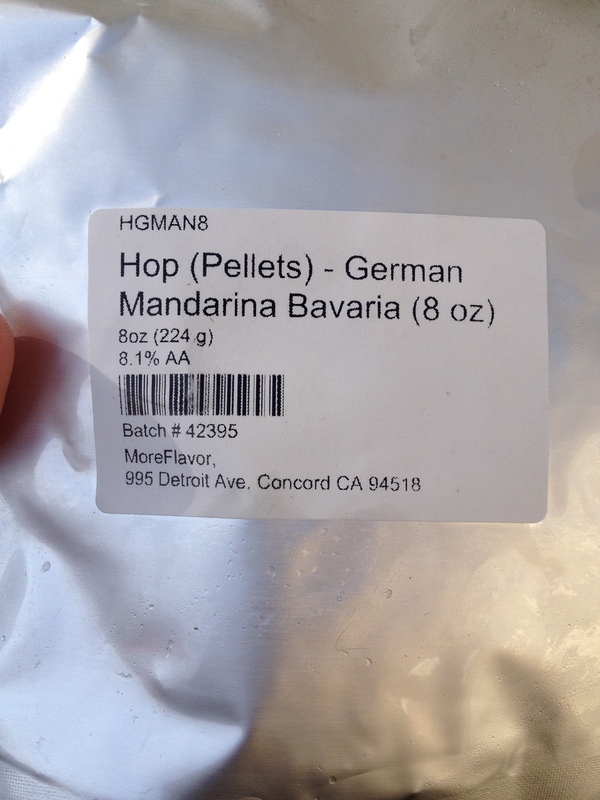 Mandarina Bavaria hops are a new hop to me…pretty excited about these. I love new hops, honestly it is incredible that after years of making hoppy beers there are still dozens of hops I’ve never used. These are a daughter of cascade, developed at the Hop Research Institute in Hull. 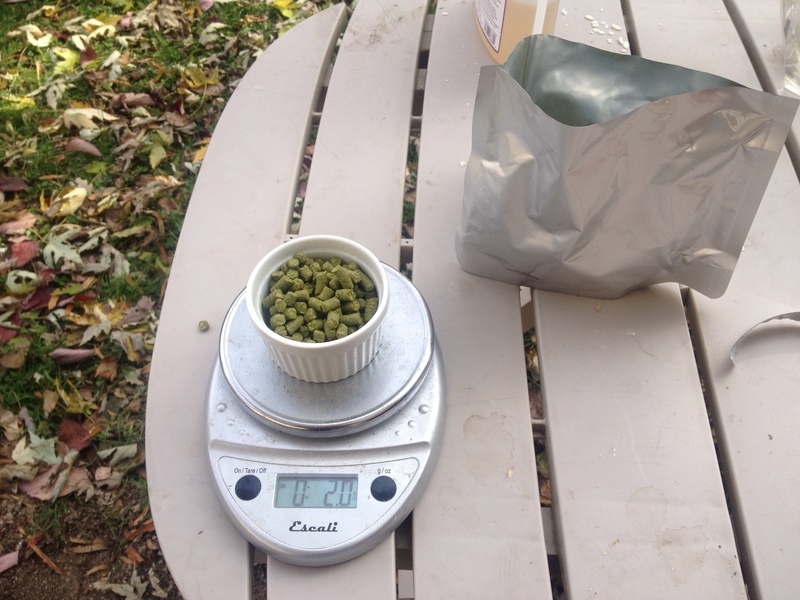 This hop is described as “tangerine” in aroma and flavor (the pellets smell amazing). I’ve asked other homebrewers about this hop and several people have told me “tastes like cuties”…those little oranges you buy in the crates at the grocery store. Yep, I’m sold. Sacc rest at 153 F for 60 minutes. No pH stabilizer was added to the water. The mash volume was about 4 gallons. After the rest, the grain was sparged with 5 gallons of water. Wort was thoroughly vorlaufed at both sparge and mash. Wort was boiled for an hour. Added gypsum and whirfloc to the boil. 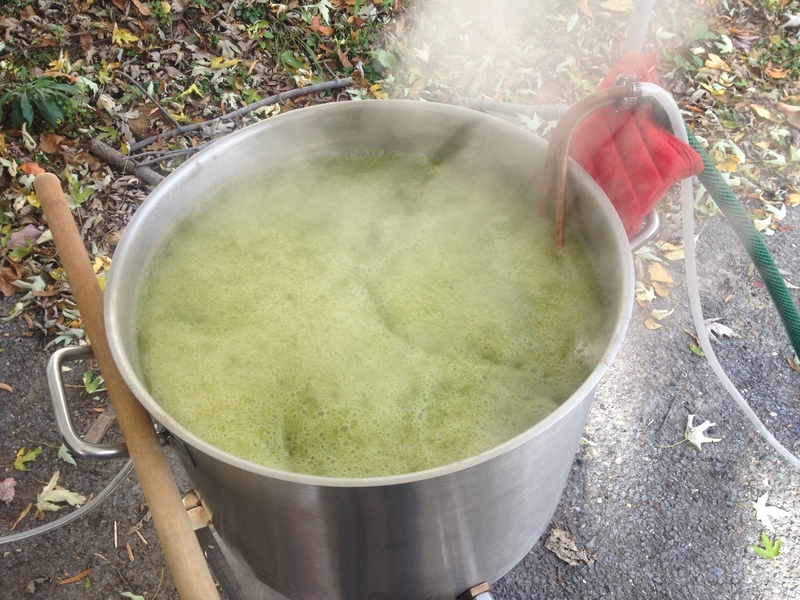 Brewing the wort….it is supposed to be that green, trust me. Received a portion of the yeast cake from the Belgian Brown #2, fermentation was underway in less than 12 hours. Well behaved fermentation overall, finished out nicely. A couple of weeks in the fermenter. Beer was dry hopped in the primary keg for about a week and then transferred to the keg with two more ounces of pellet hops in a hop bag sunk to the bottom of a keg. Overall, this was a well behaved beer. Beer served in a mason jar. 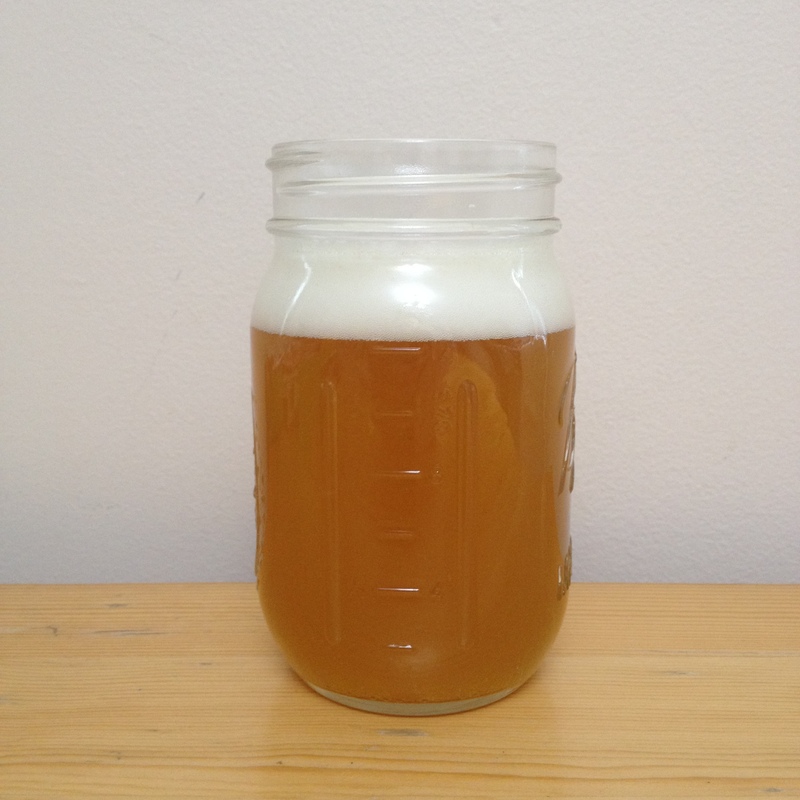 Beer is orangish and cloudy with a nice white head of small and medium bubble, moderate retention and medium carbonation. Looks really nice. Aroma is citrus, oranges, like cuties. Overall the aroma is nice but it is a little mild overall. It smells really nice but overall it is subdued. Taste, oops. There is something off with this beer. There is a harshness to this beer that I can’t quite describe. Almost tastes like burnt toast or something. Was this the acidulated malt? I’ve used it before and never gotten this flavor. Not sure what is going on. Aside from that, beer has a medium to light body, nice carbonation on the palate, decent feel and connectivity, the hops shine through and the beer tastes like an orange. That off flavor is not the dominant flavor but this beer might not survive the duration due to that error. We will see. Overall, a disappointment. I need to make this one again and reduce the naked golden oats and leave off the acidulated malt maybe. This hop deserves a better beer / post than this. I’ll make it up to it. Well, win some lose some. This one might be a punt for me. I shouldn’t have messed with the grain bill so much. I think it would have ended up much better if I allowed the hops to shine through or hadn’t changed so many variables on the onset. I hold out hope that it will improve, if it does I’ll put it in an upcoming post where I re-review all the beers that got bottled (Brett beers and so on). I want to do this one again but simplify the grain bill. So I guess I’ll try that. The next two beer posts are going to be a Galaxy saison and a Waktu saison. Never used Waktu (Wakatu) hops before so I’m pretty excited about that. Also, bottling up my Russian Imperial Stout…after two months in a bourbon barrel. That will be exciting. I have a lot of beer in fermenters right now…so there will be a lot of posts coming up. I’ve been promising some Kluyveromyces posts…and they are coming. My guess is that the “sharp” flavor you experienced in this beer was from too much Golden Naked Oats. This could be from two reasons, both due to the oats: (1) Oats can come across as astringent in large doses, and I’ve never heard of anyone putting as much as 18% in their recipe, as you did. Not sure why they produce this flavor, but it happens. (2) The “sharp” flavor also could be due specifically to hydrolyzed oils in the oats. Oats are relatively high in fats/oils compared to other grains and thus need to be extremely fresh when used for brewing. Their oils quickly hydrolyze which results, after fermentation, in an awful sharp, metallic flavor. I’ve had it happen in a couple batches. It happens when there’s a low PH, which happened to me in the bottle during refermentation with lactic acid bacteria. It’s catalyzed by a low Ph from what I’ve read, which could be a result of fermentation or perhaps due to the acidulated malt. you are correct. I made the correction. Thanks. Cool coincidence, about 1 or 2 months ago I brewed my first Saison and used Mandarina Bavaria and oats (rolled). I also added some tangerine peel into the boil and some brown sugar (too much really, didn’t realize at the moment). It came out very good, hop aroma is sweet but could not really make the asociation with tangerine, I read it should be more like the satsuma tangerine flavor that is a sweeter variety, not my favourite. It has a small acid aftertaste, maybe because of the peel (not satsuma).